SIERRA VISTA, ARIZONA — Carol Ann Lockwood, 76 years old, of 638 South Taylor’s Trail, Sierra Vista, Arizona, 85635, passed quietly, surrounded by family, after a brief but intense battle with AML , on the evening of Jan. 24, 2019. Carol was born on Dec. 22, 1942, to Homer P. Hanes and Mabel B. Stratton Hanes. Carol grew up in Kalispell and Ronan and loved to ride horses and hike. Carol married Charles M. Lockwood on Jan. 4, 1959. Chuck and Carol celebrated their 60th wedding anniversary this year. Carol retired from the Missoula Mercantile/Bon Marche after 25 years of loyal service, working her way up from shipping and receiving to department manager. Carol then worked at Jore Corporation and the Polson DMV. Carol embraced her role as wife and mother with a strength and loyalty that would be rare to match. 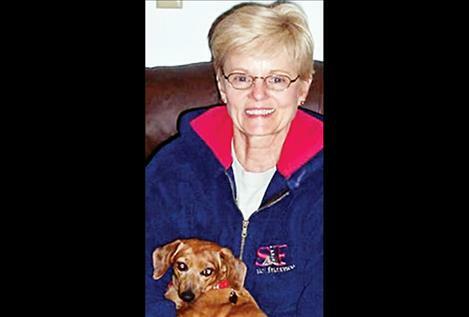 Her love for animals could only be outweighed by her devotion and love of family. She was an intense lady with a quick wit and a smile that could bring order to any kind of chaos. Most of all Carol was a “caregiver extraordinaire” and a loving mother of three children. Carol is survived by her husband, Charles M. Lockwood; her three children: Cheryle K. Sylvester ( John), Wanda D. McAndrews (T.J.), Montie R. Lockwood; her seven grandchildren, and her five great-grandchildren. A “Celebration of Life” will be held this summer in Polson. In lieu of flowers, the family respectfully requests donations be made to the Mission Valley Animal Shelter, 36251 Reservoir Rd., Polson, MT 59860.